The Zodiac Sign Scorpio Man (October 23 - November 21), Scorpio Personality Traits for Male born under October Zodiac signs. Scorpio man is always hidden, he is closed from prying eyes, and from the first meeting, it is absolutely impossible to see what he's all about. But this man, who is a walking enigma attracts attention with his mysterious and even mystical aura, which gives him an unearthly and surreal charm. His interlocutors have the impression that he is able to influence people not only by words or actions, but also with hypnotic fluids, which can be seen from his velvet half-closed eyes. But despite his apparent coldness and even a certain arrogance, the Scorpio man is very passionate and hot, he is a maximalist, both in friendship and in love. Scorpio man is very sociable and pleasing in society, he may seem light-heartedly cheerful, friendly and open, but he will never admit people around more than at arm's length, and on all questions about his personal life and secrets, he simply jokes or jump from the answer. It is impossible to expose or surprise Scorpio man - this is a clever strategist who knows how to think through the entire path of his movement forward, and prepare an escape route in case of failures. It’s impossible to defeat him, he was born only to win, but his victories are not loud and visible, but quiet and peaceful. It is useless to compete in strength and wisdom with the Scorpio man, he will never go into an open battle, but with pleasure prove his superiority to his opponent when a good opportunity comes. The only situation that can provoke anger and aggression from him is someone trying to infringe upon his self-esteem. It can explode like an oxygen cylinder and strike his offender a sudden blow, which will be very precise and very painful. Anybody who tries to enter into a battle with a Scorpio man, should remember that he never forgives insults, and never misses when striking. It is better to have this representative of the zodiacal circle as a friend than as an enemy. Love for the Scorpio man is never enough, he prefers to love beyond measure and excessively. The opinion of people around him is not that important to him, he's not at all focused on tips and warnings of friends, because he prefers only his own sensibility, his laws and his own orders in everything. Scorpio man can be a friend, but always has a very small circle of true friends that are able to understand him and tolerate his difficult nature. Scorpio man is never indifferent to anything, even though outwardly he may be cold and indifferent. Nothing escapes his attention, and so deceiving the Scorpio man is a thankless job. He very much loves beautiful women. 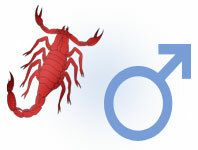 He can care for his lady for a long time and even romantically, make a proposal to her on his knees, but this is not a gust coming from Scorpio man's soul, it is an effort to conform to the standards of conduct in society, adapt to the pattern of conduct so as not to scare his partner from the beginning. In relationships, the Scorpio man can be very courteous and well-mannered, but he can become a tyrant, if his partner will always try to deceive, trick, or cheat him. Scorpio man always has very high demands to his woman, and does not tolerate any compromise. The straightness of a representative of the zodiacal circle often causes his lady to suffer, because he can easily make his uncovered truth and stinging remarks against her in public. This is a favorite pastime for the Scorpio man. In personal relationships, Scorpio man will never tolerate the dictates of his partner, he will always fight for a sole rule in the family. He will be a demanding, strict but fair father to his children. A woman who associates her destiny with the Scorpio man must accept him for what he is, not take his criticism personally, and try to lead everything to humor, and then their relationship will be quite harmonious. Not secretive. Just varied layers of trust. Doesn't divulge information freely. Could possibly be used as a weapon against them. My friend has a personality just like this. You scorpio's seem to accomplish a lot. Very true my zodiac sign is Scorpio but I don't understand that it says we can never tolerate or compromise if I get a true love I can compromise anything for her in my range or I can tolerate her if I think that she truly loves me. [COLOR=Purple][/COLOR] Yeah its very true.. He's very secretful and suspicious. Full description of Scorpio Man, character traits and personality characteristic for male Scorpio.